Want to be freed from paying your phone bills -- forever? That would no more be a far-fetched fantasy for Koreans according to a plan by a newly merged Korean telecom giant. The Korea Communications Commission approved Wednesday the merger of KT and KTF, its mobile service affiliate, paving the way for a host of innovative services across wired and wireless platform. The merged KT, with its combined annual revenue of 19 trillion won ($14 billion), is expected to introduce a variety of hybrid service packages by coupling its land line, broadband and wireless assets. 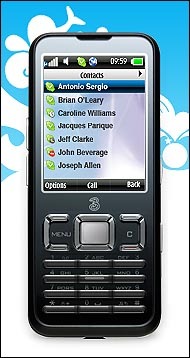 However the most intriguing concept by far is a WiBro phone KT is developing with its partner Samsung. A KT official involved in the project told a local media outlet, "KT will install WiBro component inside a Samsung smart phone to provide both 3G WCDMA and WiBro service from a single handset." Codenamed Wi-Omnia since it will add up WiBro connectivity on Omnia, a Samsung’s smart phone popular among Asian and European consumers, the new phone is rumored to feature a 3.3 inch LCD screen, 3 million pixel camera, Bluetooth, WiFi and Windows Mobile 6.1 edition. WiBro is a service brand for KT’s mobile WiMax which promises up to 50Mbits per second of seamless broadband data communication over wireless network. It currently covers Seoul and other major metropolitan areas and further expansion of the network is on the way. Theoretically, users with a WiBro handset can surf the Web at super speed in subways, bus and high speed trains without stopping for a wireless hot-spot, since it guarantees mobile broadband connectivity at up to 120Km per hour. KT hopes to develop a fresh new market segment with the upcoming WiBro phone; however, the real potential of the phone is that it can double as a mobile VoIP phone, opening the door for completely free phone calls over wireless network. Scores of VoIP phones and services are available already for sure and Skype is selling Internet call plans for mobile phone users available in two Nokia models. Truphone, Fring and other software-based Internet phone service providers are also giving away free widgets designed for iPhone, iPod Touch and other smart phones. However for many Koreans accustomed to over 100Mbps broadband Internet at home, Skype’s mobile VoIP service is far too sluggish a standard to be called a mobile broadband -- it still relies on the antiquated 3G network. The WiBro phone KT is developing with Samsung promises users that they don’t have be tied to a landline or hunt for a WiFi hotspot for VoIP calls and Web surfing anymore, leading to a complete freedom from nagging phone bills on the way. Wi-Omnia for KT may be launched before this June and SK Telecom, KT’s domestic archrival also hinted at selling its own version as early as March. Apple’s iPhone and other latest smart phones have resolved most of the thorny issues in user interface and hardware. And the VoIP phone market is forecast to jump from virtually nil in 2007 to over 250 millions by 2012 according to Disruptive Analysis, a London-based consultancy. But smart phone users have complained that current wireless infrastructure cannot satisfy the demanding bandwidth appetite of today’s advanced handsets. Introduction of WiBro phone equipped with a potential backdoor for VoIP service signals that the weakest link of smart phone industry will be finally fixed. If I have seen farther than others, it is because I have stood on the shoulders of giants. Road is stepped by feet, history is written by people. Every step of man is writing his own history. 시대는 인물을 낳고 그 인물은 책을 쓰며 책은 또다시 세상을 바꿉니다. [세상이 주목한 책과 저자]에서 다루는 책과 저자는 어쩌면 그 자체로 인류의 역사이기도 합니다. 14세기 이후 시대는 ..
음 요즘 힘든 일이 참 많아서 다 그만둘까 생각하고 있었는데, 다시한번 마음을 고쳐먹게 해주는군요.